This week the Utility Worker Assault bill was sent to Governor Andrew Cuomo's desk. 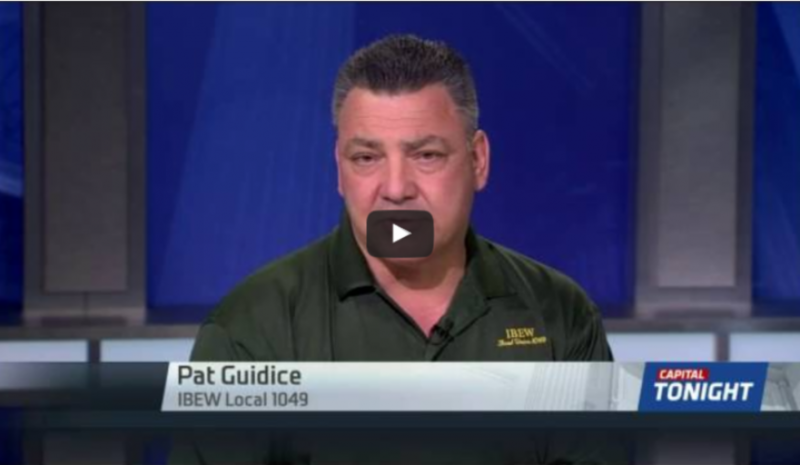 IBEW 1049's Pat Guidice went on Capital Tonight to talk about why the Governor needs to sign the bill. Click the image above to watch his entire interview. Below is a Letter to the Editor that appeared in Monday's Press and Sun Bulletin and Ithaca Journal from Business Manager Gary Bonker. You can read the letter below. The Utility Worker Assault bill, which elevates assault of a utility worker in the second degree to a class D felony, was delivered to Gov. Andrew Cuomo on Aug. 8 for a signature. Utility workers perform vital services and are, with increasing frequency, the victims of assault and aggression. In particular, employees who read meters or are involved in collections are most vulnerable. Often, they must enter a premises alone to conduct their work in circumstances that are potentially hostile. These workers have been threatened, attacked, molested and, in some cases, robbed simply for doing their job. It is currently a felony to cause injury to peace officers, police officers, firefighters or EMS workers with the intent to prevent them from performing their duties. In light of utility workers' ever-demanding levels of responsibility, particularly in storm restoration or as emergency first responders, this bill is necessary. The Utility Workers Assault Bill is already law in New Jersey, Massachusetts and Pennsylvania. We urge Governor Cuomo to sign this bill to curtail any future acts of aggression against hard-working utility workers.